The Kansas budget appears to be teetering on the edge of a fiscal cliff, but that’s an illusion. We’ve already gone over the edge. Lawmakers approved a budget for fiscal year 2015* that spends $326 million more than the state officially expects to take in. Covering that $326 million difference almost completely drains the balance in the state’s bank account. That brings us to the edge of the cliff. What happens if the FY 2015 revenue does not arrive as estimated? With the bank balance tapped out, current year spending — already too meager in many areas like education — must be cut, and cut late in the fiscal year when it’s difficult for agencies to make quick adjustments. That takes us over the cliff. 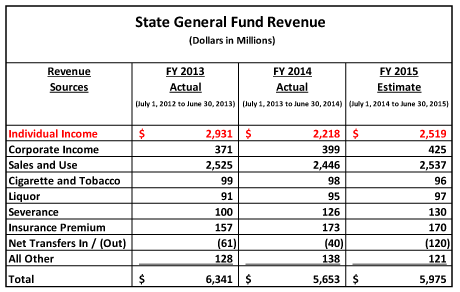 The official revenue estimate in place for FY 2015 is too high. The estimate was produced in April with incomplete information about how the dramatic tax policy changes in Kansas had affected FY 2014 income tax receipts. In the official estimate, the estimators predicted individual income tax receipts would be $2.525 billion in FY 2014 and then dip slightly to $2.519 billion in FY 2015. We know now, though, that individual income tax receipts fell $713 million in FY 2014, bottoming out at $2.218 billion. So why is anyone using this unrealistic revenue estimate? Because it allows for the illusion that the Kansas budget has not already gone over the cliff. It allows that illusion to persist until the revenue estimators meet again to formally revise and update the FY 2015 estimate — something that won't happen until November. FY 2016 revenue will at best be flat as even more income tax rate reductions kick in. The bank account will be empty. Something will have to give. And that’s the optimistic scenario. * Fiscal Year 2015 is July 1, 2014 to June 30, 2015. ** The top income tax rate drops from 4.9 percent for tax year 2013 to 4.8 percent for 2014 and to 4.6 percent for 2015. The lower rate drops from 3.0 percent in tax year 2013 to 2.7 percent for 2014 and 2015. *** KPERS stands for the Kansas Public Employees Retirement System.